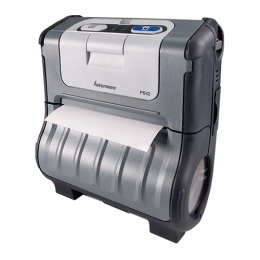 Ease of use was a major focus for the Honeywell PB42 mobile printer during its development. It consistently supports employees in the field, such as delivery drivers, in the timely management of their tasks. Print receipts and vouchers with a resolution of 203 dpi and a speed of 50 mm per second. Long, uninterrupted operation is ensured by the double-battery concept with two lithium-ion batteries. The batteries are located on the front of the PB42 and can be replaced easily with just one hand. Prints with 203 dpi at 50 mm/sec. The printer status is recognizable at a glance, thanks to the integrated power indicator. This saves valuable seconds in daily use. Users also save time with the simple media change function. The PB42 is optimized for paper from the roll and fanfold paper. The connection of the printer, for example, to mobile computers occurs via USB or serial interface. There is an optional Bluetooth version available, to ensure a wireless connection within a radius of 100 m. The centralized printer management reduces maintenance requirements and functions easily via SmartSystems.